As Israel's war machine and Hezbollah fighters continued to exchange fire, diplomatic efforts intensified in a bid to end the violence. Hezbollah proposed a deal to free Israeli soldiers in exchange for the release of Palestinian prisoners. Speaking ahead of a visit to the region, U.S. Secretary of State Condoleezza Rice said an immediate ceasefire would be counter-productive, allowing Hezbollah to regroup for further attacks on Israel. There was an urgent need for a ceasefire in the region, but conditions had to be right, she added. 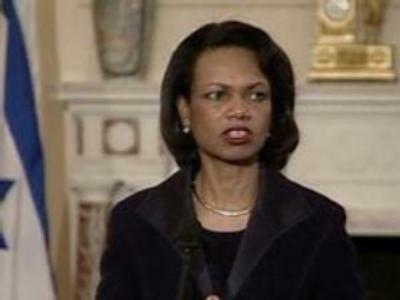 Rice made clear where she believed blame for the current crisis lay. “I don't have any doubt that, given the control of the Syrian government and the Iranian government, that Iran and Syria have gone out of their way to inflame sentiments and the world ought to call them on it,” she said. Iran's President Mahmoud Ahmadinejad accused Britain and the United States of backing Israel's attacks on Lebanon.“Britain and the United States are accomplices of the Zionist regime and its crimes in Lebanon and Palestine. A bunch of cowards are ruling the countries neighbouring Lebanon and innocent people are being killed before their eyes,” he said. There is growing sentiment that setting up a buffer zone between Lebanon and Israel, patrolled by a multi-national stabilisation force, offers best hope for a lasting peace. Israel's Defence Minister Amir Peretz said he would accept such a force, preferably led by NATO rather than the UN. Washington backs the plan but has all but ruled out contributing any soldiers to the force. British Foreign Office Minister Kim Howells said any stabilisation force must have the backing of the Lebanese people.